Tee off at the Hilton Templepatrick Hotel & Country Club's woodland golf course. Swim in the pool or play tennis on one of 2 all-weather courts. Savor Irish beef in Treffner's restaurant. Enjoy seared monkfish and golf course views at Treffner's restaurant or sip whiskey in the Lounge bar. Work out in the fitness center or relax in the sauna. Take a Belfast bus tour or visit Carrickfergus Castle. Don't miss out on a day trip to Giant's Causeway. Just 15 minutes from the airport by free shuttle, the Hilton Templepatrick Hotel & Country Club has a business center and 10 meeting rooms for 2-500, all with wireless internet access. 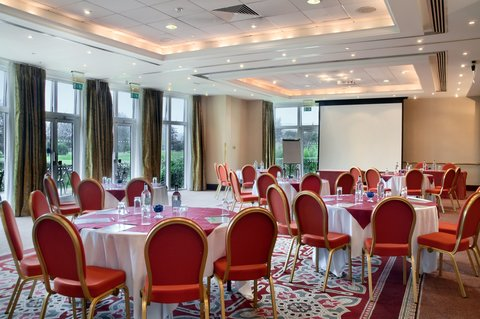 From Hilton Rooms up, all Hilton Templepatrick Hotel & Country Club rooms have separate working areas. Deluxe Rooms offer golf course views.